This 12-day accommodated overland tour takes you through the Cederberg to the Namibian border. You will visit the Fish River Canyon and overnight on the banks of the Orange River. In the Namib-Naukluft National Park you will climb to the top of Dune 45 and join a local guide to learn more about the desert ecosystem. You travel towards Swakopmund, also known as ‘little Germany’ and in Kamanjab you experience the everyday life of a Himba tribe. 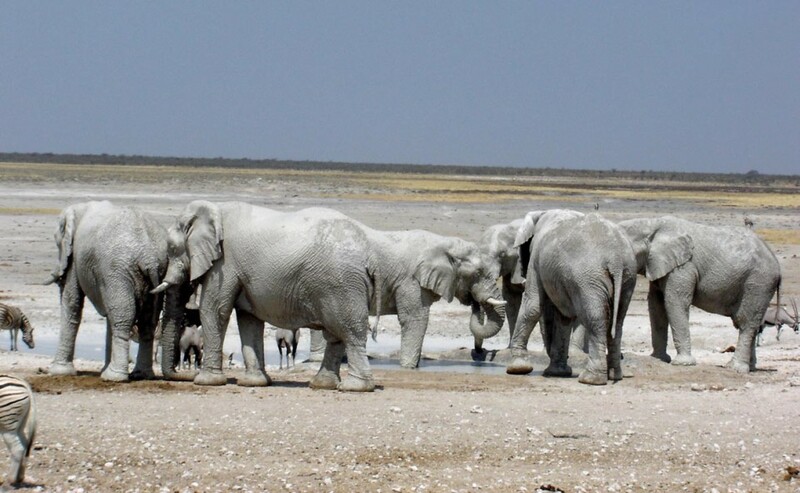 In the Etosha National Park you will go on various game drives before you return to Windhoek where the tour ends. Leaving Cape Town, there’s one last photo stop in Table View for a spectacular panorama of Table Mountain. On the way to the Cederberg you will join a guided hike with a local guide. After the 3-hour tour, lunch will be prepared and afterwards you continue to Piketberg for a wine tasting at a local wine farm. After your arrival at the accommodation for tonight your guides will give you a full briefing on the tour. 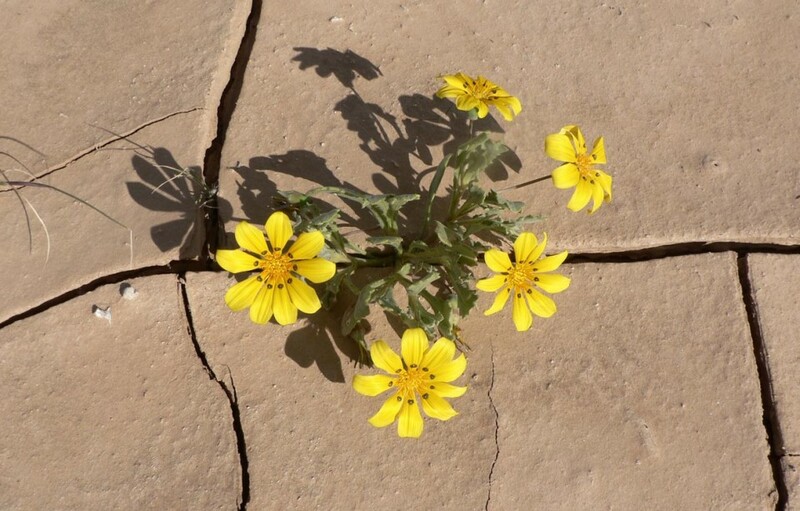 Today you travel through the Northern Cape and Namaqualand, stopping at the remote town of Springbok known for its diamonds, copper mines and vast plains of desert flowers in spring. After crossing the Namibian border you settle into chalets overlooking the river that forms the border between South Africa and Namibia. This morning you can canoe down the Orange River (optional activity, not included in the rate) or just relax at the camp along the river. 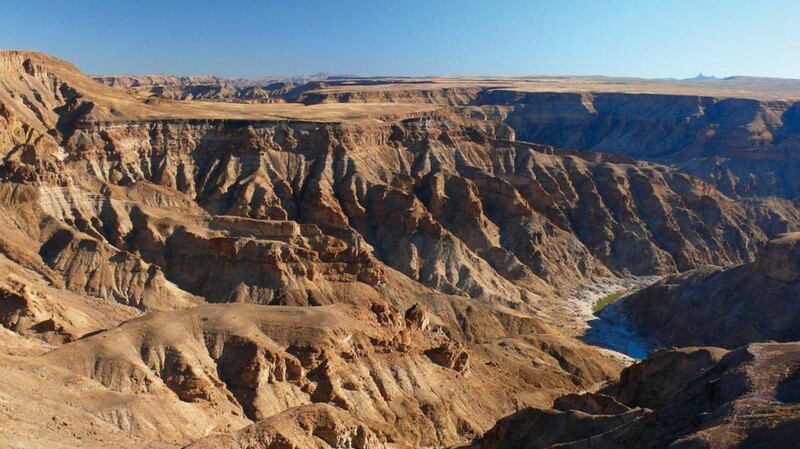 After lunch you travel in north to the Fish River Canyon and do a scenic hike along the edge. Later you return to Ai-Ais to check in to your accommodation for the night and to enjoy the hot springs. Today you travel into the Kalahari area of Namibia to visit the Kokerboom Forest. 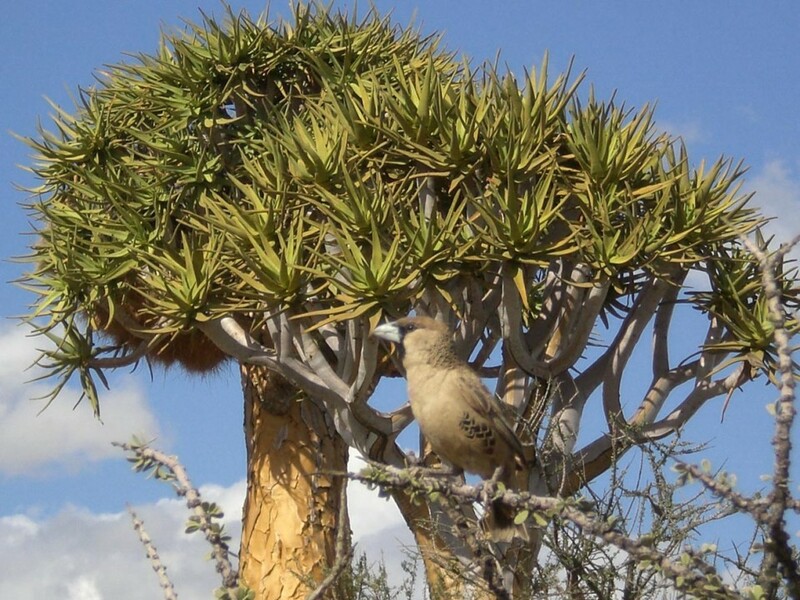 The Kokerboom is also known as the Quiver tree as it was used by the indigenous Khoisan people for making quivers for their arrows. The Namib-Naukluft National Park’s remarkable landscapes and the massive sand dunes in the Sossusvlei desert area is one of Namibia’s geographic gems. 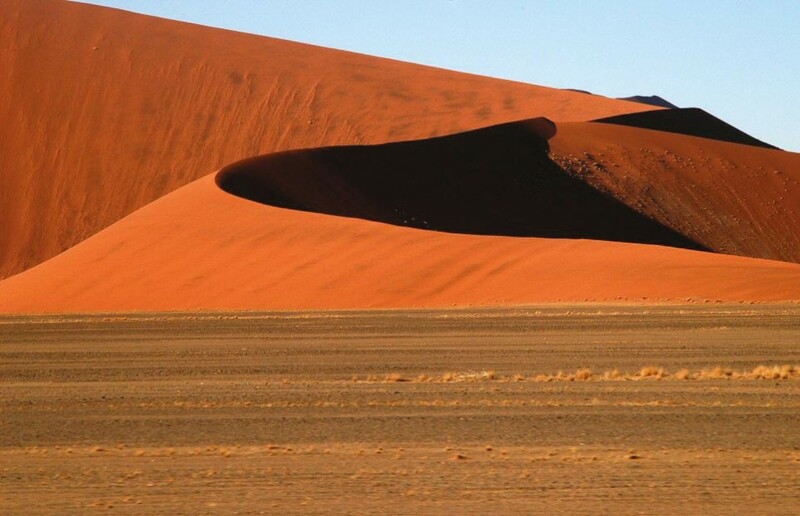 After an optional visit to the !Xung (San) people, you travel to the Namib Desert where you spend the night. A full day will be spent in the Namib-Naukluft National Park. You try to ascend the 170 m high Dune 45 and you have the option of exploring the Deadvlei by 4x4 or joining an individual wild cat walk at your lodge in the evening (optional activities, not included in the rate). A short walk into the Sesriem Canyon is scheduled for the afternoon. Accompanied by a local guide you start off the day with a 3-hour nature walk whereafter you cross the Tropic of Capricorn on your way to the Atlantic Coast. Your first stop is Walvis Bay where you may see some flamingos. Then it’s on to Swakopmund, the ‘adventure capital’ of Namibia. Many optional activities like quad biking, sand boarding, skydiving and scenic flights are available here, but you can also explore the German architecture, shops and restaurants of this town. Today you drive inland towards Kamanjab in the north-west of Namibia. The following morning you will spend time with the semi-nomadic cattle farming Himba people. The Himba are easily recognisable by their unique style of hair and skins coloured with a mix of ochre and fat. You travel in south-easterly direction to the Etosha National Park. The elevated truck allows for excellent game viewing over the salt pans. The bungalow accommodation is situated inside the park at Okaukuejo or Halali and both camps have floodlit waterholes where animals come to drink. Optionally you can search for nocturnal animals on night game drive or join an morning drive with a Namibian game ranger. En-route to Namibia’s capital Windhoek, you stop at a craft market where you can buy authentic African crafts. On arrival in Windhoek you will be taken on a short drive around the city. Your tour officially ends upon arrival in Windhoek but you can spend the evening enjoying the local beer and a delicious dinner at your own expense. - 11 nights are spent in twin rooms / chalets at nice camps / guesthouses / lodges. 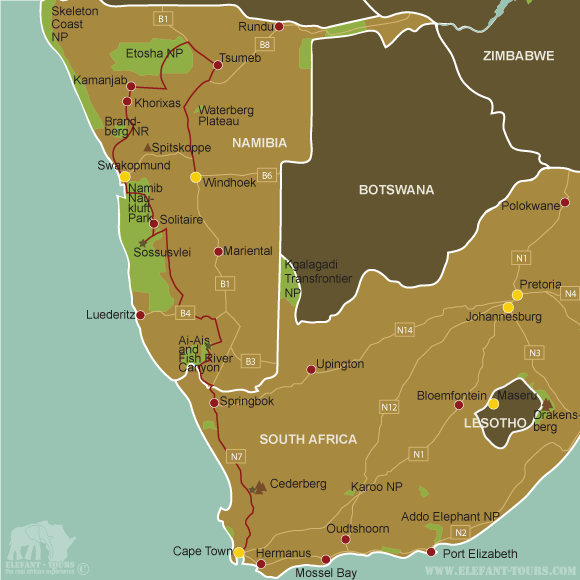 - In general European citizens do not require a visa for South Africa and Namibia.